We continue to be amazed at the volume of hits we are receiving on our little pie blog! After reaching 100,000 views on 15th February 2014, it has taken just over 6 months to jump to 200,000 views by 29th August 2014! And such has been the meteoric rise of the Pierate Ship – and the appeal of our slice of internet pie across the country (and the world) – that it is becoming a nice but increasing problem to fit everything we want to do around our “normal” jobs. That said, they always say things are better late than never, which is why we are delighted to have finally had the pleasure to once again meet up with and bestow our title of Honourary Pierateers to Ashleigh Auld and Olivia Rust. 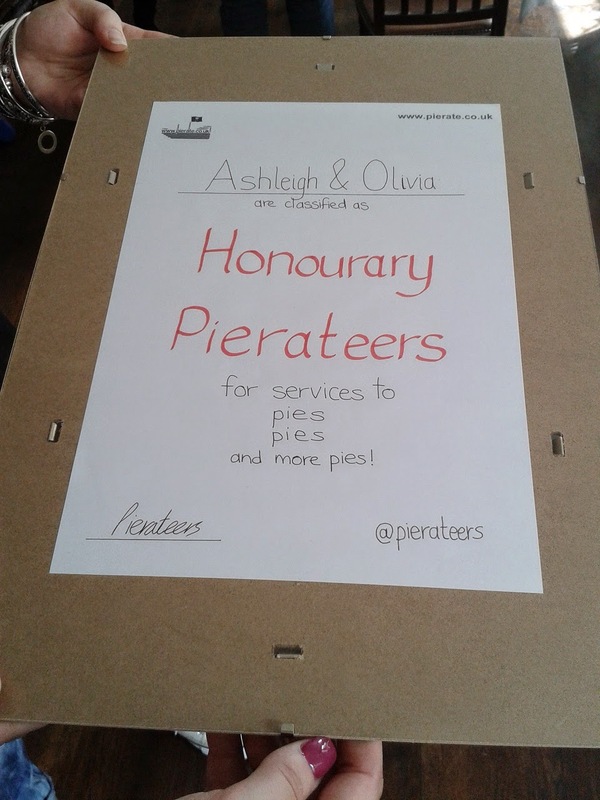 The title of Honourary Pierateer is bestowed by Pierate upon those who show great commitment to pies in general and to the Pierate blog more specifically. They are awarded when we reach a major page view landmark. November 2013 – Having been a follower of our pie blog and the @pierateers twitter feed, we were delighted to get contacted by Olivia to do our first ever interview – which formed the basis of this article about how the Pierateers came to be and what International Pierate Day is all about! December 2013 – Pierateer Rob met up with Ashleigh and Olivia in central London at Canteen London to rate a pie together. This formed the very first “Pierateer in Training” session and led to two pie reviews of Canteen’s Turkey Pie – our own Pierate review and one written by Olivia. These pies also featured in our “12 Pies of Christmas” music video! February 2014 – Pierate hits 100,000 page views and starts arranging a meet up with Ashleigh and Olivia to award them their honourary title. July 2014 – Pierateer Rob once again meets up with Ashleigh and Olivia in central London – this time to rate a pie together at The Gun, Docklands. The ladies are awarded “Pierateer in Training” badges, Pierate t-shirts and mugs and two pie reviews of the Goat pie we rated are posted online – our own Pierate review and one written by Olivia. 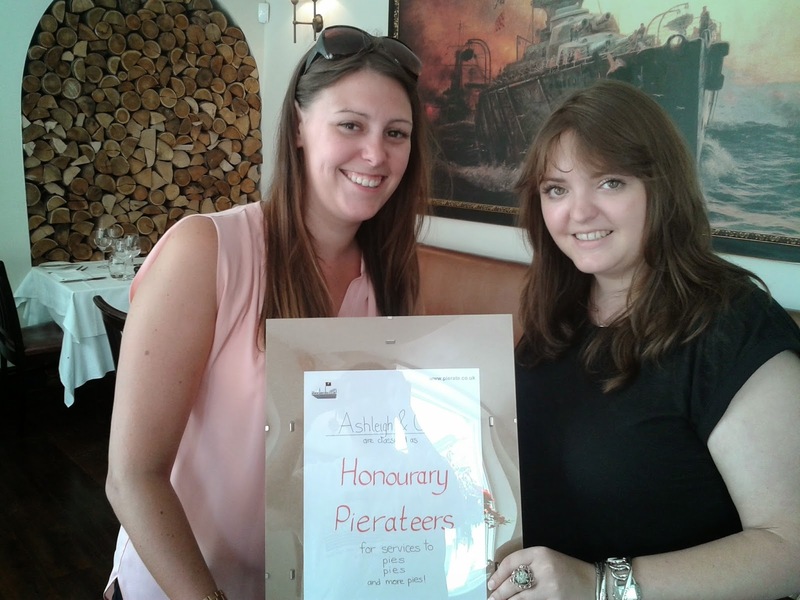 September 2014 – Ashleigh and Olivia are officially unveiled as Honourary Pierateers after we reach the 200,000 page views landmark! So a big thank you to Ashleigh and Olivia for the support they have shown to Pierate thus far! And while they are only murmurings at this point in time, we are already discussing our next meet up with our new Honourary Pierateers being a very special pie event in London, to hopefully tie-in with the 5th anniversary of Pierate! Of course, there is just one place you need to check back for more details once this pie-roject gets the go ahead and that’s www.pierate.co.uk!